We’d love your help. 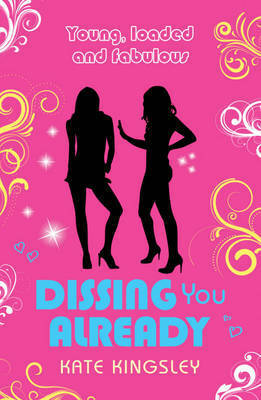 Let us know what’s wrong with this preview of Dissing You Already by Kate Kingsley. To ask other readers questions about Dissing You Already, please sign up. This review has been hidden because it contains spoilers. To view it, click here. I enjoyed reading this book. It was very interesting and I can easily connected to my school life because it deals with a lot of drama like most teenage lives today. For example, friends getting revenge and complicated relationships. I noticed that Alice changed a lot from the beginning of the story to the the end. In the beginning, Alice was in love with Rando but she was too scared to admit it because she cared too much about her social profile. She did not want to be a laughing stock for the s I enjoyed reading this book. It was very interesting and I can easily connected to my school life because it deals with a lot of drama like most teenage lives today. For example, friends getting revenge and complicated relationships. I noticed that Alice changed a lot from the beginning of the story to the the end. In the beginning, Alice was in love with Rando but she was too scared to admit it because she cared too much about her social profile. She did not want to be a laughing stock for the school. Therefore, she got a fight with Rando. However, it the end, Alice admits to the whole school that she is in love with Rando and apologizes for not being brave enough to admit it and lying about it. I thought the ending was perfection because everyone's problem was solved and Sonia got what she should for being so mean. In love with the serious as much as this part ' soon much drammaaa. Kate Kingsley has lived on both sides of the Atlantic, spending time in New York, London, Paris, and Rome - so she's more than qualified to chronicle the jet-set lives of the YOUNG, LOADED & FABULOUS girls. Kate also writes for magazines such as GQ in New York, where she's had the enviable task of interviewing fashion designers like Paul Smith, and celebrities like James McAvoy. She's currently Kate Kingsley has lived on both sides of the Atlantic, spending time in New York, London, Paris, and Rome - so she's more than qualified to chronicle the jet-set lives of the YOUNG, LOADED & FABULOUS girls.